WID supports the Department of State’s “comprehensive strategy to promote and protect the rights of persons with disabilities internationally.” In the spirit of advancing disability human rights, WID is especially committed to advocating for people with disabilities to be fully integrated in civil society. Full inclusion of people with disabilities in civil society, is living independently and supported employment. Article 19 “Living Independently and Being included in the Community” and Article 27 “Work and Employment” from the United Nations Convention on the Rights of People with Disabilities, is WID’s international focus. In 2018, WID was the only international Disabled Persons Organization (DPO) invited by the International Network for Civil Development. 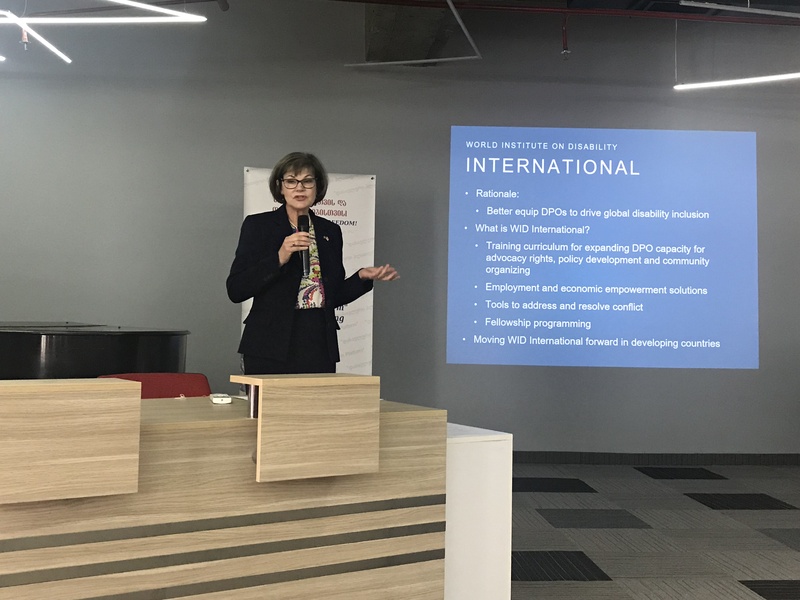 Loretta Herrington, Managing Director of External Affairs presented at the “Western Platform” forum in Tbilisi, Georgia, on WID’s international programs and practices. WID Managing Director of External Affairs & International Development Loretta Herrington presenting at the International Network for Civil Development Western Forum.